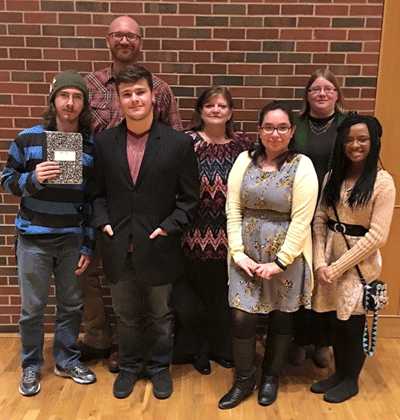 Creative writers at Cowley College had opportunities to hear two major authors during events this semester. In October, over 30 students, faculty and friends traveled to Tulsa, OK to hear Sue Monk Kidd, author of the popular book, The Secret Life of Bees, and the more recent The Invention of Wings. Kidd discussed her interest in the fictional topics she’s chosen to explore and told the audience about the many inspirations for her writing. Joining Cervantes and her students and club members on the trip were faculty members Ryan Doom and Meg Smith, as well as regional authors Ann Fell, whose most recent book, a suspense novel Sundrop Sonata, will be out before the end of this year, and Mary Coley, who recently was the Young Adult winner for the Creative Women of Oklahoma and is now a finalist in two categories for New Mexico/Arizona Book Awards to be presented later this month in Albuquerque. Fell lives in Winfield, Kansas, and Coley lives and writes in both Tulsa, OK, and Sante Fe, NM. Fell and Coley joined the group for dinner and Kidd’s speaking engagement. 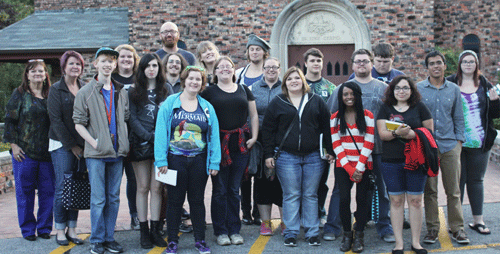 A smaller group of writers attended an event in November with Cervantes and Doom on the campus of Oklahoma State University in Stillwater, OK to hear author Brad Meltzer. Meltzer’s writings include everything from comics to thrillers, and the ideas he gave the audience covered several facets of creativity and life. In addition, he was inspirational in the midst of the tragic events during OSU’s homecoming parade. Meltzer discussed that his mother had always told him not to look to the negative but instead to the helpers. He explained that while there will be those running away from tragedy, we can always find those running to it, to help, and that this was the case in Stillwater. He highlights heroes, many unknown ones, in his children’s book, and he encouraged crowd members to take time to thank those who have made a difference in their lives. By doing so himself, he had received many blessings. Cowley College has an active writing program and would like to invite the community to the upcoming student showcase, Life: Through Words and Lens, which will take place in the Wright room at 6:30 p.m. on Thursday, December 3. If you have any questions about the event or the program, please contact Cervantes at marlys.cervantes@cowley.edu or in the Humanities department at the College.